SUPERVALU REMAINS IRELAND’S most popular supermarket but Tesco is now right behind them in second place. The latest Kantar supermarket shares show that SuperValu managed to retain its top spot, but a strong showing from Tesco has it just 0.1 of a percentage point behind. SuperValu accounted for 22.1% of the consumer spend over the course of the 12 weeks to 10 September, making it the country’s most popular supermarket. Coming in third place was Dunnes Stores with a 21.6% share of the spend. Bargain supermarkets Lidl and Aldi took fourth and fifth place with 11.8% and 11.6% of the consumer spend between them. All of the top supermarkets showed growth in people spending. 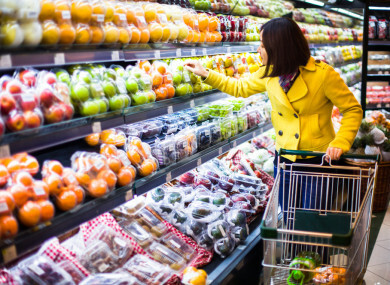 Kantar Worldpanel Ireland monitors the household grocery purchasing habits of 5,000 demographically representative households in the Republic of Ireland. All data discussed in the above announcement is based on the value of items being bought by these consumers. Email “SuperValu still Ireland's most popular supermarket but Tesco is right behind it”. Feedback on “SuperValu still Ireland's most popular supermarket but Tesco is right behind it”.